As many of you know, I have spent the last two years as an Island Batik Brand Ambassador. 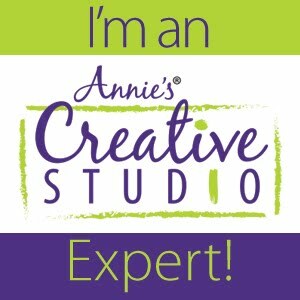 It's been an amazing fun and rewarding time as I have had an opportunity to represent a great company, work with beautiful fabrics, have my designs included in their Quilt Market displays and last, but not least, to meet and work with some of the most talented designers I know. But I've got some other projects I want to work on and my schedule will only permit so much, so I did not reapply to be an Ambassador for 2019. 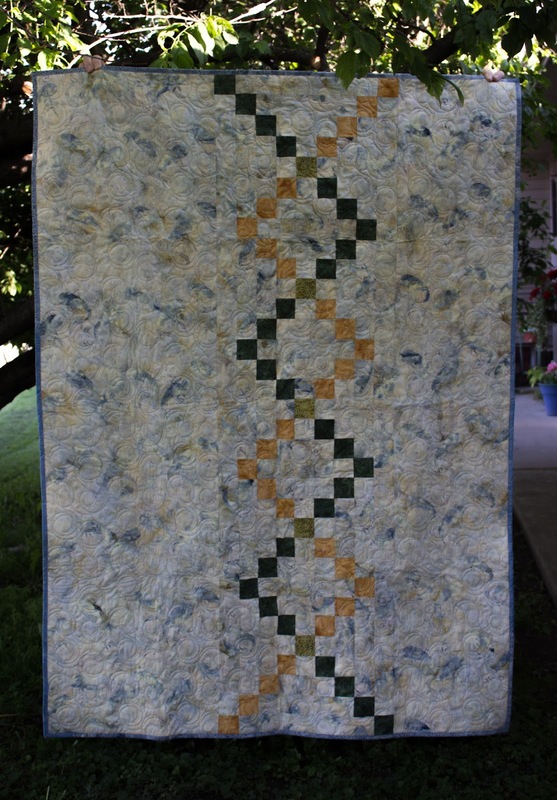 As a final farewell, I want to showcase some of the quilts I've made over the last two years using Island Batik fabrics. The quilts aren't in any particular order and I've included a quick description to make it easy for you to find the patterns. By no means is this all of them - it's only about half! This is Modern Chain. 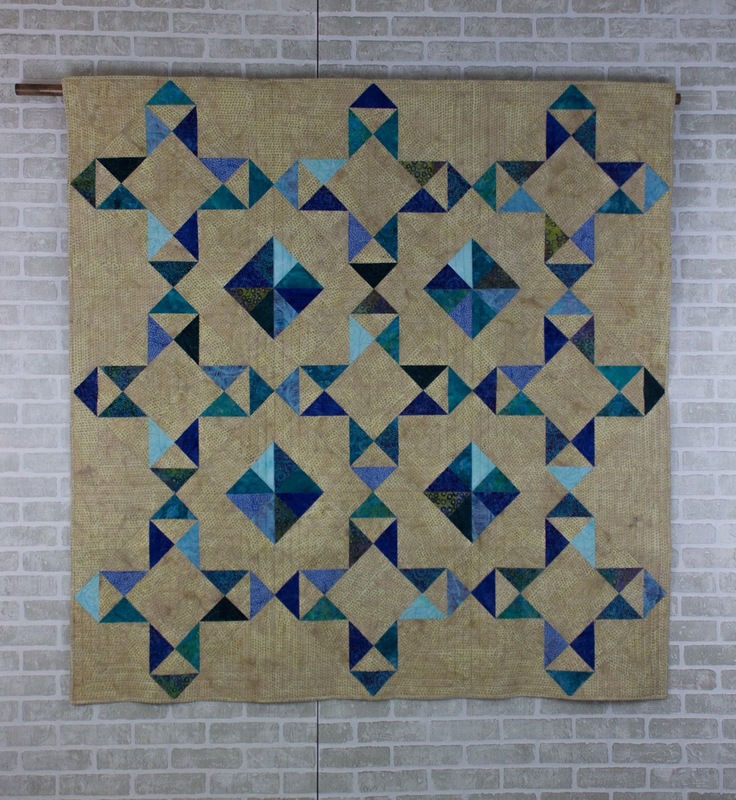 A remake of the pattern using solid fabrics was in Make Modern Magazine in 2018. I was so excited for my first international magazine appearance. 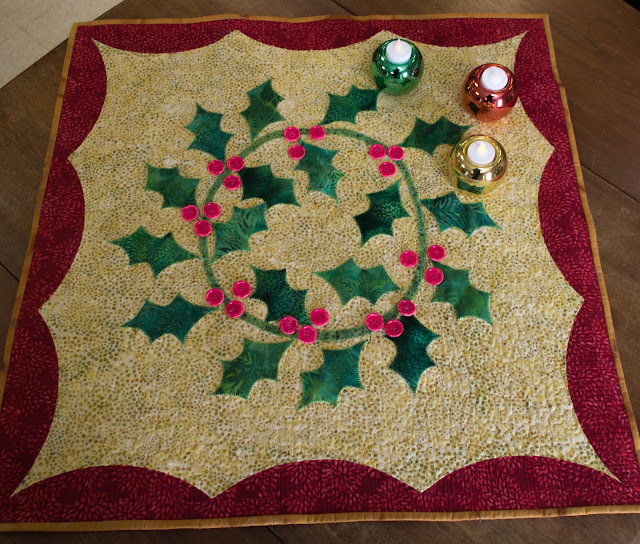 The Holly Table Topper is one of my favorites. Simple, Elegant yet Festive! The pattern is available in my Masterpiece Quilting's 2018 Christmas Collection book available on Amazon. I used Island Batik's Sakura collection to make this beautiful quilt for the Back to School blog hop in 2017. The design was my Black & White Express pattern available as a pdf download on Bluprint. 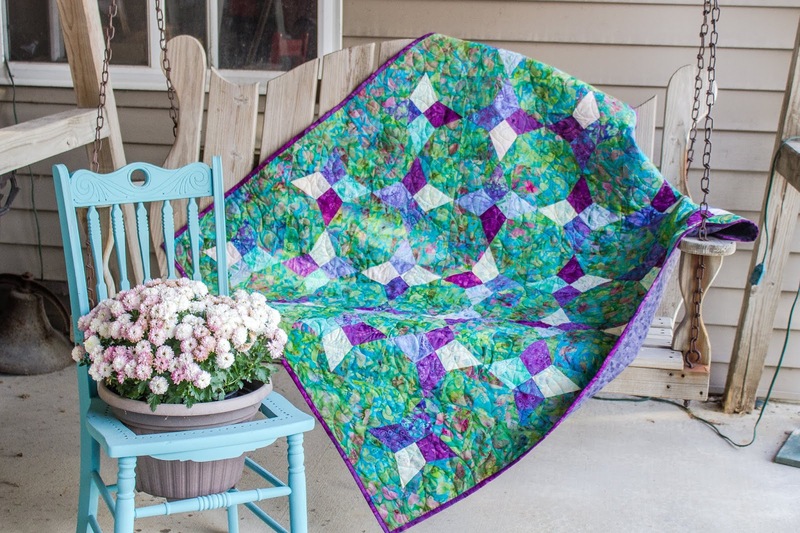 Isn't it amazing how different fabrics totally change the look of a quilt? Take a look at the pattern and then this photo. Charming Stars & Pinwheels was first published by Annie's as a lap quilt. The larger version featured Island Batik fabrics and is on the pattern cover. This pattern will be available very soon too! 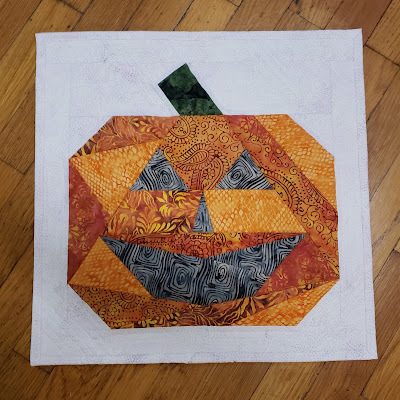 This paper-pieced beauty brought a lot of joy to our table at the time of my Mother-in-Law's passing in 2018. Some cut flowers we received matched perfectly for the photo shoot. Plum Delicious, aptly named for the fabric collection it featured was made for a Blog Hop in 2018. 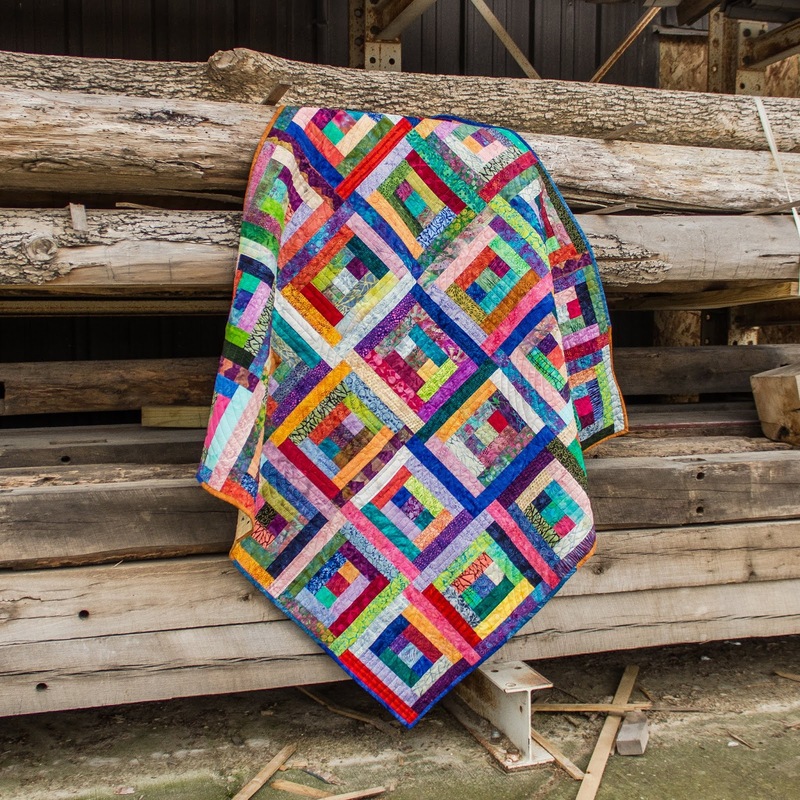 The PDF pattern for this customer favorite is available and stay-tuned for this quilt in a different colorway in the next few months! 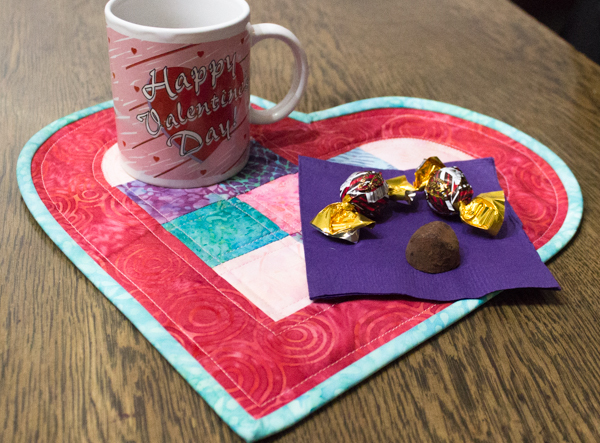 Valentine's Day is right around the corner and this oversized mug rug will make a great gift! If you are like me, my desktop tends to serve a lot of functions including breakfast nook and lunch station - so a mug rug is a necessity. 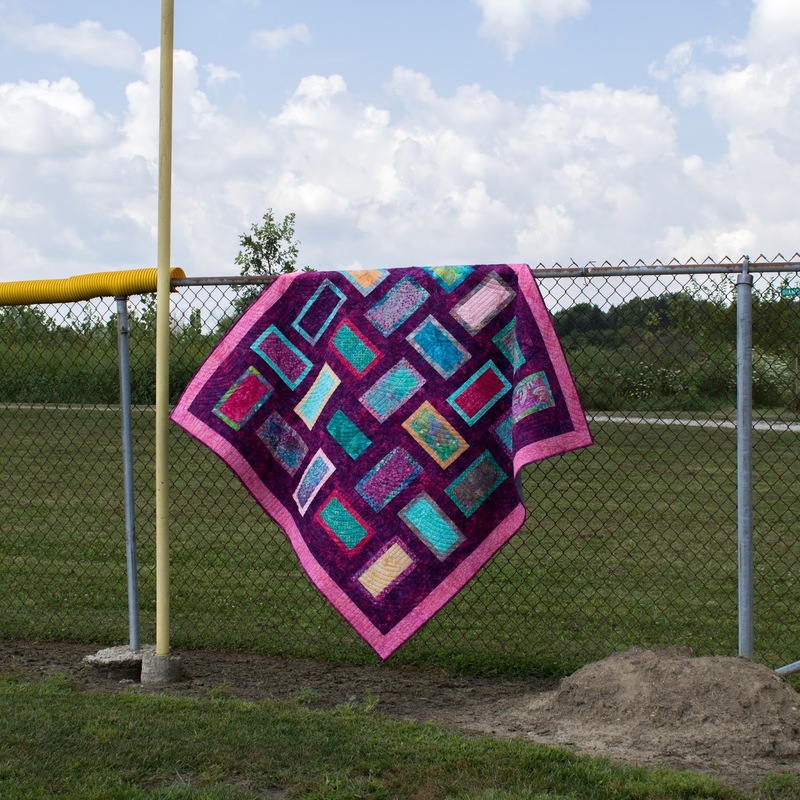 A pdf pattern is available for download on Bluprint. The monthly challenges for the Ambassadors always kept me on my toes. 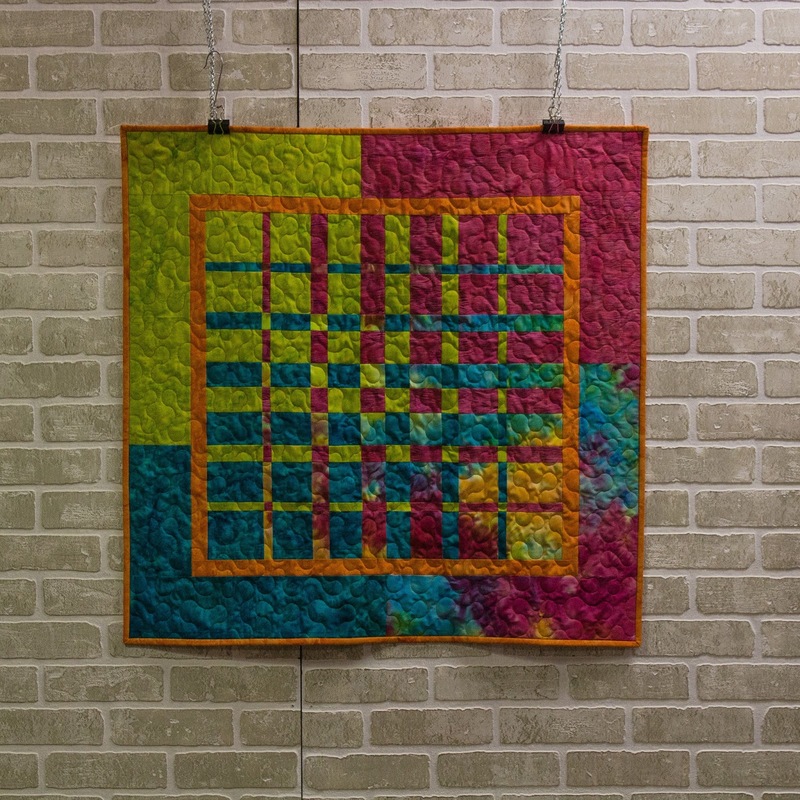 In this challenge we needed to use a new technique - so I used Ricky Tims' Covergence method to make this stunning wall hanging. 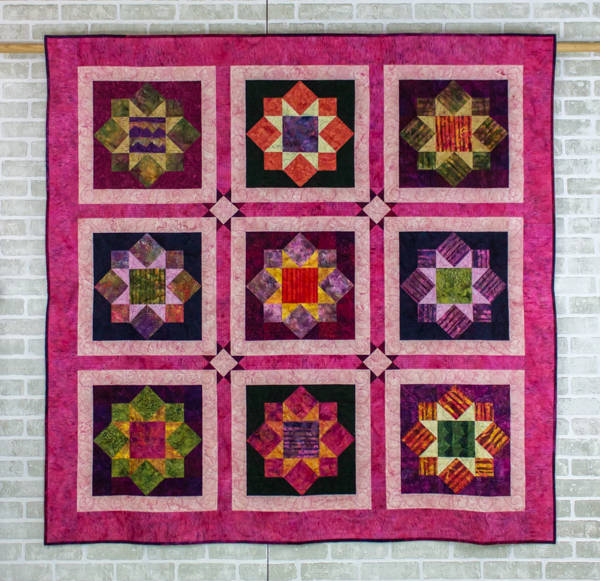 My Spinning Wheels design was inspired by a vintage quilt I purchased at an auction. Another design which will have a pattern available soon ... I think I need to get busy releasing new patterns! 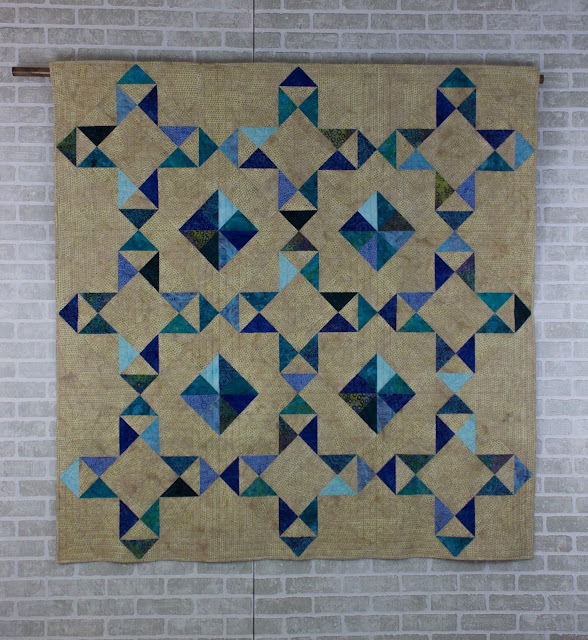 This quilt features Island Batik fabrics in my Star Bright pattern. I made a smaller version here and again, am blown away by how much the look changes with different fabrics. If you don't believe me, take a look at the original Star Bright pattern. I will be totally honest, I was never a fan of paper-piecing. I can tell you horror stories of fabric sewn to both sides of the paper. Well, I'm starting to embrace the method... slowly but surely. There would have been no way I could have made this beautiful pumpkin using traditional patchwork. Earlier I mentioned that being a Brand Ambassor gave my quilts an opportunity to be displayed in the Island Batik booth at Quilt Market. Here, I used the Oh Deer collection and my Fractured Quilt pattern to create this stunning quilt. 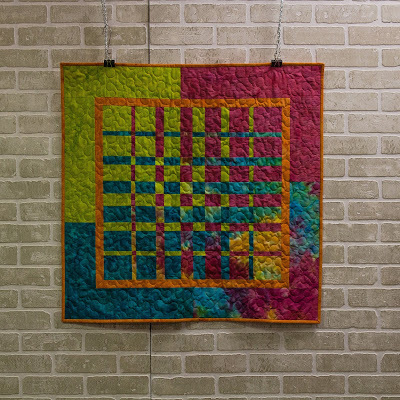 I caught up with the quilt in Houston last fall for a quick visit. 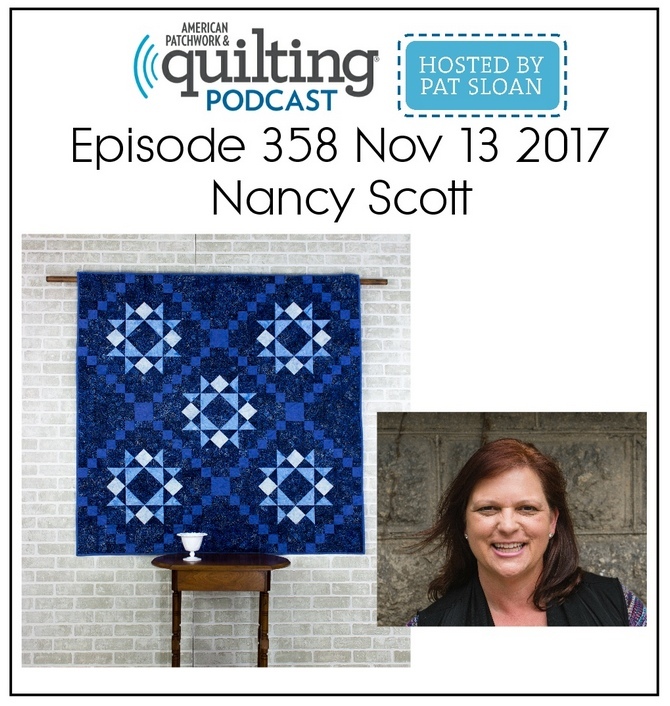 It's on the road traveling to quilt shops and trunk shows until 2020! While it's traveling, you can still make the quilt - here's a direct link to the pattern. 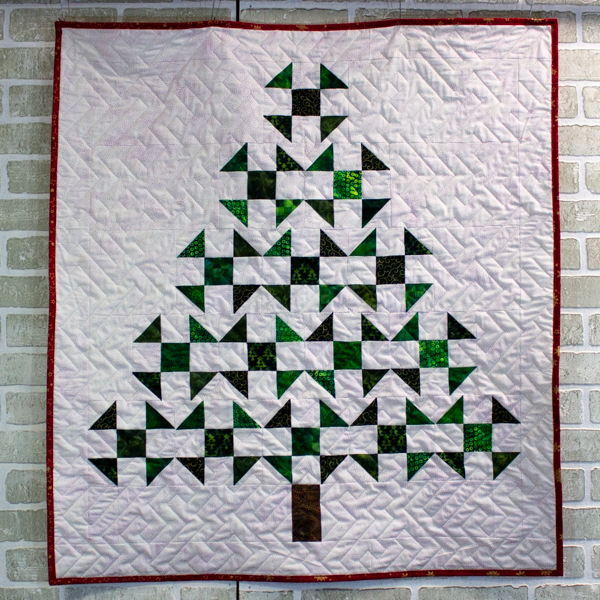 Oh Christmas Tree is one of the patterns in my Masterpiece Quilting's 2018 Christmas Collection book available on Amazon. 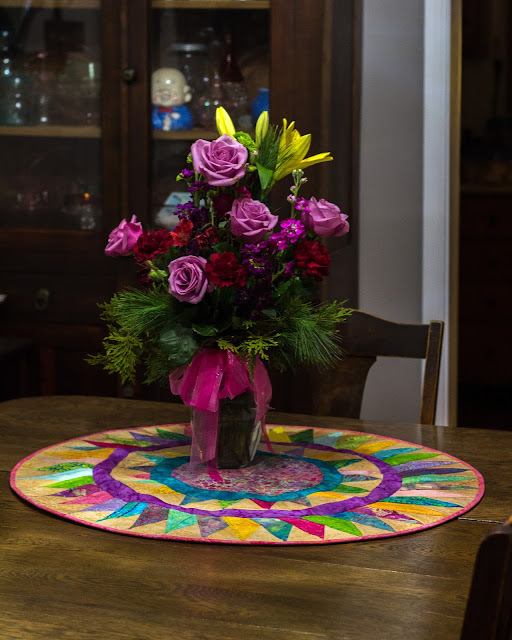 It makes a beautiful wall hanging that is deceiving easier to make than it appears. 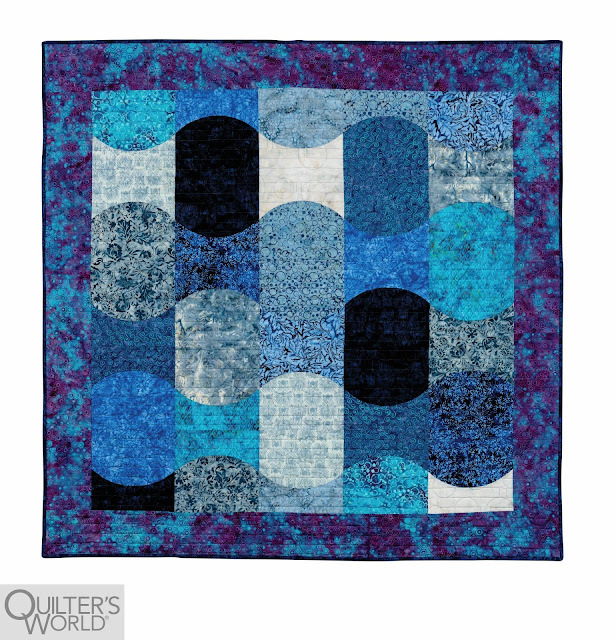 Baubles was in the Winter 2018 issue of Quilter's World Magazine. I love the softness of this design and how it showcases the fabrics so well. Dots & Dashes is the last quilt I made as an Ambassdor for the Getaway Blog Hop. 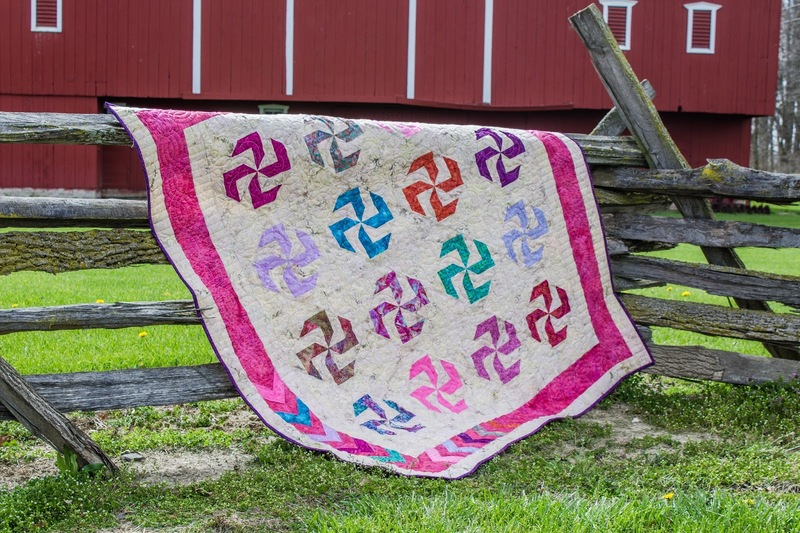 It's a fun and spirited quilt. The PDF version of the pattern is available for purchase in my Etsy store. And finally, one of our Charity projects was making Kennel Quilts. 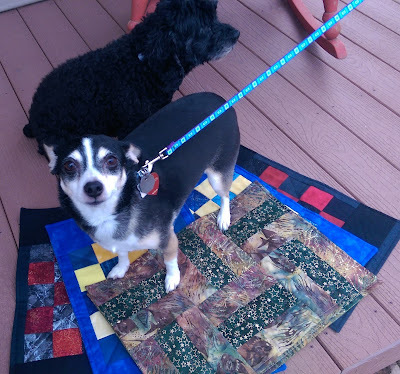 Miss Zoey and Miss Lilly gave their "paw of approval" before the quilts went off to pets in need. You can learn more about the Kennel Quilt program here. Won't you participate with me? If you have made it this far in the blog post ... that was a lot to get thru! ... 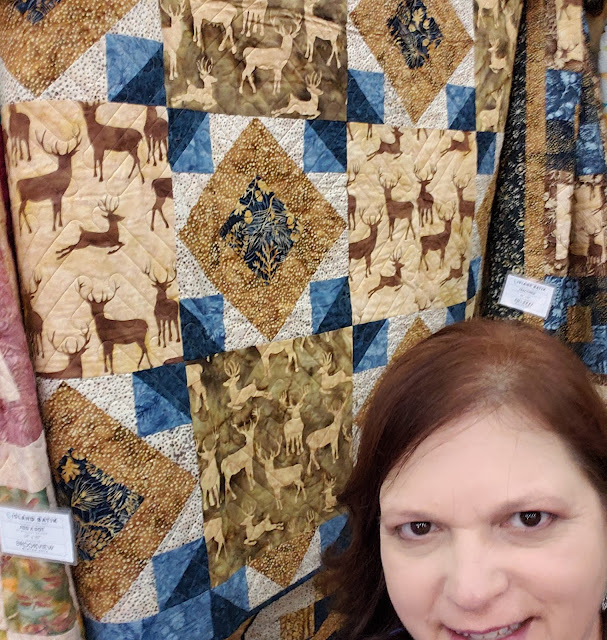 I invite you to follow along on my quilty journey by subscribing to this blog, following my Masterpiece Quilting page on Facebook or on IG: @masterpiecequilting. It’s amazing how much you have accomplished so far ~ and I know the lack of time in getting patterns released. I’m glad we were ambassadors together for 2017 & 2018 and I look forward to being alumni together as I know we both have personal goals that do involve the beautiful Island Batik fabrics. best wishes for your continued success! 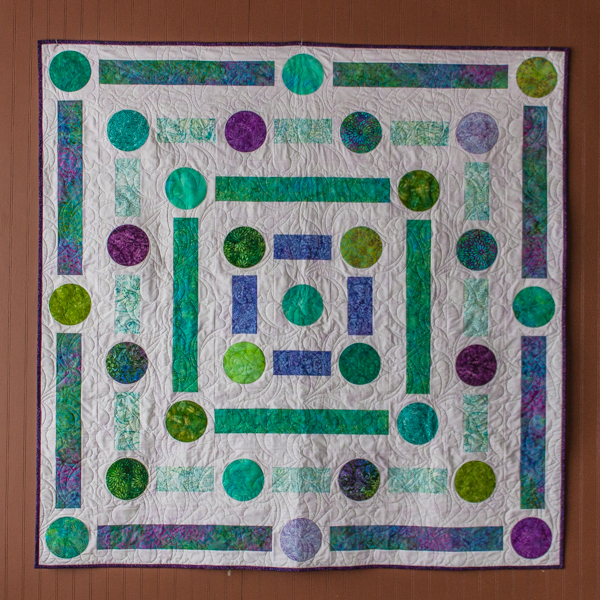 What an amazing gallery of quilts! I think my favorite is the colorful version of Black & White Express, with Stepping Out and Spinning Wheels as close seconds. Good luck with your other projects in 2019! What an amazing year! Congrats on all of your beautiful work.